Anyone using the 6m soul for foiling yet ? I'm 70 kilos and I have 9m hyperlink ultra light and I love it but I'm get over powered a lot of the time and I need a smaller foil kite . I have smaller tube kites but I love the lift from a foil kite for doing foiling foot switches . Small foils are great fun. Much less twitchy than small tubes. You will be impressed with the low end and range on them too. With line changes, 15 to 45kts on a surfboard. I switched from single strut 9m LEI to Soul 10m for lightwind and liked it so much (no more swimming in under 10 if I dropped the LEI) I also got the 6m. The 6m on 20m lines I can foil from 11/12 knots, change to 14m lines at 14/15 knots and it's really great not sure of the top end range as I would change to my 5m Cabo at 17/18 knots. I'm 75Kg and have Zeeko carbon foil with Carver front wing on Levitaz Exo board, hope that helps. What's your range like on the foil with the 10m? 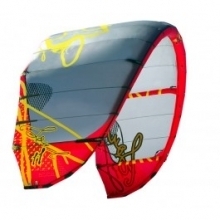 It is the perfect kite for surf foiling though, as it is higher AR than newer LEI kites, and loads of depower and range. The higher AR on small kites is great, as you got so much more peak power which is essential quite often, in waves. Can ride with this 5 m2 in 13-14 knots with a surf wing, being average weight, works excellent! How does switching to foil kites change your riding style? The idea of a smaller overall kite, no pump, and better bottom end is super attractive. Foilholio talks of wave riding with foil kites, but I have yet to see it with my own eyes. Frank Rosin and Adam Withington have a few clips where they are ripping around pretty nicely, but there is still something drawn out about their riding between transitions that I don't see in the top LEI foilers. Namely, Greg, Nicholas, (understandably, they have their own LEI brands) but also Philipe Caneri, Oyvind, Steph66, Peter Frank etc. Have seen Gunnar in waves with a foil but mostly looking like surf foiling without the kite than say someone like Nicholas or Marc Leblanc who blend the kiting and wave riding a bit more. Do you foil kite guys feel there is a difference in "how" you can foil with the two different types of kites? jumptheshark, I'm not sure how it affects riding style, but the feeling at the bar is very different. I much prefer any of the foils I have to my tube kites. The bar pressure is even and solid, though fairly light. With the tubes the bar pressure feels nonexistent. I'm used to that now and DO use my tube kites in strong and gusty winds sometimes. They're OK. But the foils, I feel, are really great. The turning is predictable. Whereas with the tube kite, it seems you pull the bar, wait a moment, then all of a sudden the kite tips over and turns like crazy. And the foils seem to stay up a little better in the light wind and lulls. Maybe that's a little subjective. I was on the beach once with someone who had a big Cabrinha. He seemed to be able to launch it at the same time I launched my 15 m Sonic 2. No idea what the wind was, though it was light for sure. I’ve got a Flysurfer 12m Soul for light wind foiling and I love it . I did consider getting a smaller size for stronger winds but decided against it as quite often when it’s windier there’s also more chance of rain and in my experience with the 12m it’s performance is effected when wet !